This note fell out of a book I bought at a thrift store. I can only imagine the backstory … mom pulls a freshly baked loaf of “omish” bread out of the oven and calls for Andrew to come in and enjoy some. Andrew comes to the table and looks at a loaf that resembles pound cake. “Yum! This will be sweet and delicious,” he thinks. The first bite brings about an entirely different sensation … sourdough. “Blech!” grunts Andrew spitting the partially chewed bite onto his place. “This is awful!” Later that night someone shares with Andrew how he has hurt his mother’s feelings. 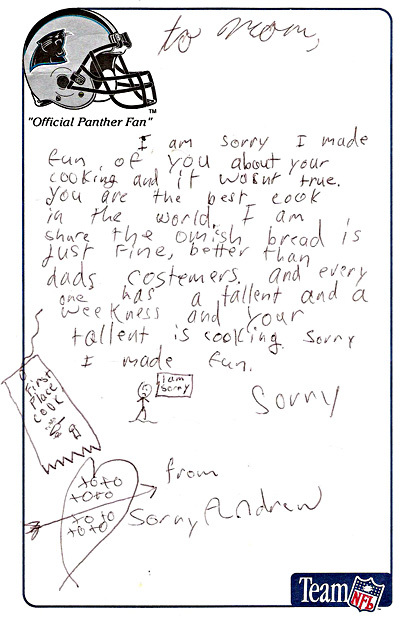 And so, filled with remorse Andrews pulls his Carolina Panthers notepad from his desk and writes his heartfelt apology.